In a technologically advancing world, computer skills have become a basic requirement in the current generation. It’s an important skill that employers look for in those aspiring to secure jobs. At Loreto, we strive to prepare our students in all ways and to equip them for a better tomorrow. Therefore, secondary students, graduate interns, and primary teachers are offered adequate skills to help them cope with the changing trends in the world. These skills help them in learning and teaching for the future. Most of our graduate interns work in offices where they use computers, and computer skills help them to work efficiently. Another graduate intern, Debora Ajak, who works as a compound manager, has also benefited from this program. Ajak has learned how to keep track of salary records for some of the school workers. In computer classes, the students learn about word processing, spreadsheets, databases, desktop publishing, and presentation design. They also learn how to type, format and save word documents. Currently the Senior Four students are learning about desktop publishing, becoming familiar with designing magazines and newspapers to present information. They are able to write a few stories about the school, which they merge with photos and place on the school noticeboards. Everyone seems to be enjoying them. Loreto continues to look for new ways to expand and to provide more opportunities for our students. 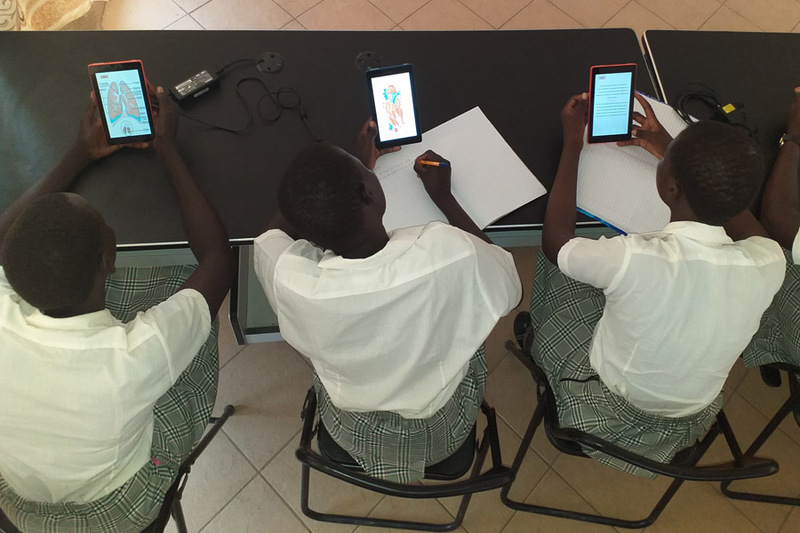 In February 2019, the secondary students started participating in a tablets program through funding from Mary Ward Mission Fund. This has made the students’ work easier since they can quickly access concepts as they learn about various subjects. “The tablets are very helpful. We use them for revision during our free times, like Wednesdays after breakfast when our younger sisters are training in the primary school. This has helped us as candidates to manage our free time wisely. We can see all diagrams described vividly and openly, especially for the science subjects,” says Ating Kaman, a Senior 4 student. Bakhita Gimigu, the prefect in charge of the computer lab, expressed her gratitude, “The tablets have made work easy since we can get all the formulas in Math and Physics. We can also study the periodic table and processes in Chemistry subject. We can view guidelines in English writing skills. Biological systems are also available and students can have a visual presentation of what’s taught in class.